Smoky was soon adopted by another GI, Bill Wynne, an aerial photographer. He took the pup wherever he went, including 12 air-rescue missions. When Wynne was hospitalized, his buddies brought Smoky to visit. This cheered up Wynne and other wounded troops as well. 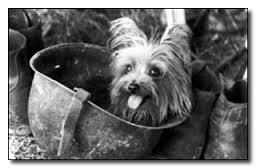 Smoky’s war-time work included pulling a line through a 70-foot culvert. This cleared the way for communications lines under taxiways used by airplanes. It helped to protect them from enemy fire. In another instance, when their transport ship was under fire, Wynne credits Smoky for saving his life. Smoky guided him away from the gunfire. After the war, Smoky and Wynne continued their teamwork. Wynne had already trained the dog to do well over 100 tricks. Smoky earned her Wonder Dog moniker. She could climb ladders, walk a tight-rope blindfolded and spell out her name. After the war, the pair continued to visit, console and entertain wounded and hospitalized troops. For years, war dogs of varied breeds have delivered all types of services to troops. They also brought companionship, comfort and camaraderie. Whether working on high-alert sentry duty, sensitive search and rescue operations, or critical logistics and communications tasks, dogs – in any season – deserve their reputation as man’s fiercely loyal best friend. After Smoky died in 1957, Bill Wynne spent time in Hollywood training dogs for major studios. He also did research and development work for NASA, in addition to his work as a professional photo-journalist. It’s located in Cleveland Metroparks, Rocky River Reservation, Lakewood, Ohio. It is surrounded by greenery and multi-purpose trails. Nearby, there is a plaque recognizing other famous war dogs. They include Stubby, Nemo, Caesar and Chips – a German Shepherd mixed-breed WWII canine-vet featured in the movie, Chips, the War Dog. Not a bad legacy for a scrappy little Yorkie! I hereby resolve to be nicer to Yorkies and other fellow canines … at least for today, anyway.